A few weeks ago, this week’s Monday night game between the San Diego Chargers (4-2) and Kansas City Chiefs (3-3) looked like the latest lame offering on “Monday Night Football” – I mean, did you really watch in entirety this past Monday’s night ugly Ravens-Jaguars 12-7 “shootout”? But thanks to a surge from defending AFC West champion Kansas City, suddenly Bolts-Chiefs is crucial in that division as a KC win would forge a three-way tie for first with San Diego and Oakland (Raiders on bye this week). The Chiefs enter off a very impressive 28-0 shellacking of the Silver and Black in Oakland. That once-maligned KC defense picked off Oakland QBs Kyle Boller and Carson Palmer a combined six times and returned two for scores. It was the Chiefs’ most lopsided road win ever against the Raiders and first road shutout since 1973. The Chargers, meanwhile, complete a three-game road trip here and blew a big opportunity in last week’s 27-21 loss at the NY Jets. 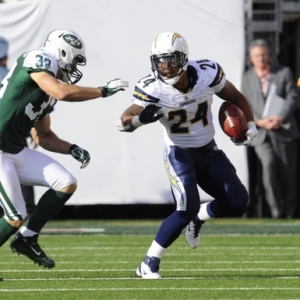 The Bolts were up 21-10 at the half and were driving for a potential clinching score in the fourth quarter and still up 21-17 when a Philip Rivers pass to Vincent Jackson went off Jackson’s hands and right to Jets cornerback Darrelle Revis, who returned the interception 64 yards to the Chargers 19. Plaxico Burress would soon after give New York its first lead of the game and the Jets wouldn’t relinquish it. The one positive of that game was that Chargers All-Pro tight end Antonio Gates returned after missing three games with an injury, and he caught a TD pass. It’s time to wonder what is wrong with Rivers, who led the league in passing yards a year ago and was an MVP candidate. He’s just the No. 20-rated passer entering Week 8 and he is tied for the second-most interceptions in the league with nine and only No. 21 in TD passes with seven. Missing Gates for three games certainly might be a part of that, and Jackson has been a bit banged up. In Kansas City’s first two games, it had a point differential of minus-79, the worst ever after two weeks for a reigning division champion. Since then KC is at plus-34. The Chiefs are averaging nearly 100 more yards a game than the first two weeks and have gone from a turnover differential of minus-6 through Week 2 to plus-6 in this four-game stretch. Obviously it should be noted that KC’s three-game win streak is a bit questionable regarding competition: The victories came over two teams, Minnesota and Indianapolis, with one combined win, and over a Raiders team that was so desperate at QB it had to start the retread Boller and then take Palmer off the bench even though he had been sitting on the couch until early last week. In its last three games, Kansas City is allowing only 13.7 points per game. But, again, consider the quarterbacks the Chiefs have faced. The Chiefs offense still is rather vanilla. But RB Jackie Battle has been a huge surprise with Jamaal Charles out for the year. Battle has 216 yards of total offense in the last two games. And Dwayne Bowe has 18 receptions for 311 yards and three scores in the winning streak. Rookie first-round pick WR Jonathan Baldwin saw his first game action against the Raiders and should help open up the offense. Cassel has a 94.8 passer rating in the winning streak, but the Chiefs still are 30th in the NFL in passing yards per game. Injury-wise, the Chiefs are in pretty good shape this week. San Diego, not so much. In question as of this writing for the Bolts are left tackle Marcus McNeill (neck, probably out), receiver Malcom Floyd (hip) and linebacker Shaun Phillips (foot). McNeill obviously protects Rivers’ blind spot. Gates, by the way, came out of last week’s game OK and will play. Kansas City in reality started to turn its season around in Week 3 against these Chargers. After getting slaughtered in the first two weeks, Kansas City lost only 20-17 at San Diego on Sept. 25 as a 14.5-point dog on the NFL odds. The Chargers led by 10 points on multiple occasions, but they needed an Eric Weddle interception at midfield with less than a minute remaining to secure the victory. Rivers struggled in that one, throwing for 288 yards but no TDs and two interceptions (Gates missed that game). Ryan Mathews ran for 98 yards and two scores to lead San Diego. Cassel was 17-of-24 for 176 yards, two touchdowns and the one INT for the Chiefs, while Bowe had four catches for 67 yards and a score. The Bolts have opened as a 3.5-point favorite with the total at 44 on NFL odds. The lean is about 65 percent on the Bolts. San Diego is 2-4 ATS overall and 1-2 on the road. KC is 4-2 ATS overall and 1-1 at home. The ‘over/under’ is 3-3 for both. San Diego has covered just once in its past seven as a road favorite of between 3.5-10 points. The Chiefs have covered past four as a dog. The ‘over’ is 5-1 in Bolts’ past six as a road favorite of 3.5-10 points. The ‘under’ is 4-1 in Chiefs’ past five as a home dog. The ‘under’ is 3-1-1 in past five meetings. The home team has won 22 of the last 31 games in this series, and the Chiefs have won 11 of their past 16 at Arrowhead vs. San Diego. The Chiefs opened the 2010 season with a 21-14 win against the Chargers on “Monday Night Football” in the first regular-season contest at the New Arrowhead. Rivers is 5-2 on MNF and has a 106.7 passer rating in those games. If it was wintry weather for this one, I’d be inclined to go Kansas City. But it appears that it will be nice on Halloween night, with clear skies and temps in the low 40s. I might hold off and see if this falls to three points because realistically if it rises to 4 it’s not much different than 3.5. But I think San Diego wins by a touchdown, so take the Bolts. And go ‘under’.